This year, resolve yourself to write more thank you notes and letters to friends and family. Email is always a great way of communicating. It's fast! But it's a welcomed feeling to get a letter in the mail, isn't it? At More Than Paper, it's always the first thing we open! In a sea of bills and junk mail, a handwritten note goes a long way. Today we have a great selection of personal stationery from which to choose and tips for writing great notes. Boatman Geller's collection of trendy yet classic styles of stationery, note cards, and note pads at More Than Paper are all great for thank you notes and everyday correspondence. From quatrefoil to chevron, herringbone to Aztec, there's a pattern for everyone. 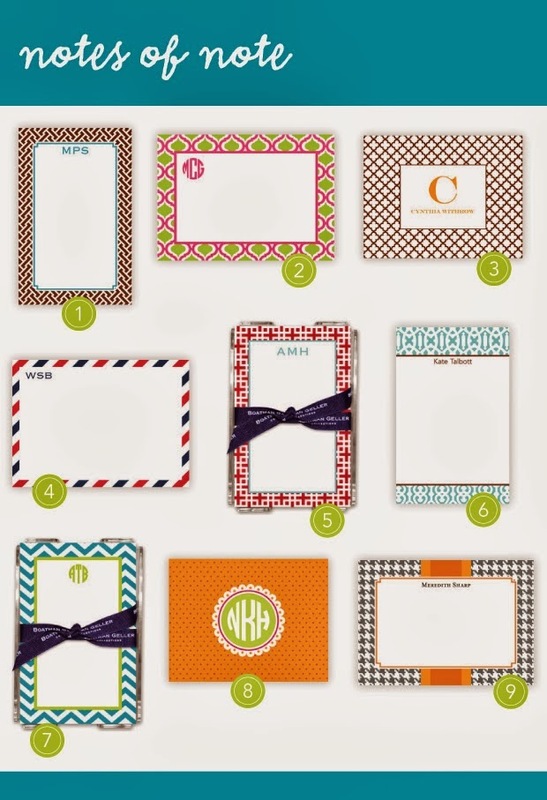 There's also a monogram, typestyle and color combo for every taste, too! What's your favorite note below? Shop our wide selection of Boatman Geller products here and see all the products specifically at the end of this post! Keep a running list of thank you notes to compose right on your desk! Every time a gift comes in, someone does something nice for you, or you attend a dinner party or play date, write it down on the list. Every weekend, or once a week when it's convenient for you, take a few minutes to catch up on your list and write a note. Cross it off and be done with it! Always include specific details about why you appreciated the gift, how it makes your life better, more interesting, or more fun. The more specific the better! Feel free to keep it short! A few lines letting the person know you are thinking of them and why you are thinking about them will make them feel good. The process doesn't have to be arduous for you! Include some personal details about what you have been doing, or your family is up to to keep it interesting. End by asking a question. This may prompt the recipient to write back and become a "pen pal!" What are your tips for writing notes? Which of the above Boatman Geller stationery designs is your favorite? We'd love to hear - share your thoughts here or on our Facebook page. 1. Stella Notepad: from Boatman Geller's custom collection, which means you can create your own using different colors for the pattern and inner border! 5. Lattice Cherry Memo Sheets in Acrylic Holder: from Boatman Geller's custom collection, which means you can create your own using different colors for the pattern and inner border! 7. Chevron Turquoise Memo Sheets in Acrylic Holder: from Boatman Geller's custom collection, which means you can create your own using different colors for the pattern and inner border!